Like the bee girl finding her fellow bees in Blind Melon’s vibrant misfits-take-all video for “No Rain,” attendees of conventions–particularly format specific conventions- are offered a welcomed opportunity to frolic with their own, and perhaps win over potential converts. 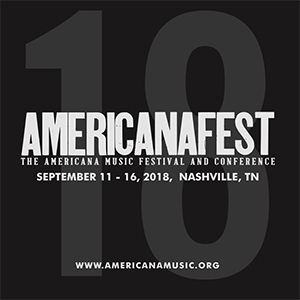 This year’s AMERICANAFEST or American Music Festival & Conference goes down September 11th-16th in Nashville. Thousands will descend upon music city: artists, industry folk, and fans alike, to celebrate the genre, beloved for its broad yet unmistakable alchemy of folks, roots, country, soul and blues-based music. Revellers will include managers, agents, publishers, all manner of peeps behind the curtain taking in seminars, panels, and, of course, live music. Performers fittingly straddle genres and generations, from John Prine (and his friends), to Alejandro Escovedo, to The Band of Heathens, to the Nitty Gritty Dirt Band, this year’s AMERICANFEST promises live music spawning stories to break bread over this Thanksgiving. Sure to be a standout among standouts is this year’s Americana & Awards Show, the “marquis event.” It’s a night to pay tribute to “distinguished members of the music community,” chosen by the Americana Music Association. The event includes 6 member-voted awards and multiple Lifetime Achievement Awards. And they mean business. (Johnny Cash and June Carter Cash performed together for one final time as part of the event). But, they’re not to be outdone by fellow legend alums Stephen Stills, Joan Baez, Robert Plant, Bonnie Raitt, and Dr. John (with Dan Auerbach) to name a few. P.S., Mary Gauthier hosts Songwriters in the Round. And as if all of this weren’t enough, the whole shebang culminates in something a bonus charity event: WoofStock. That star-studded affair happens September 16th at Ascend Auditorium, featuring Emmylou Harris, John Hiatt and the Goners, Jamey Johnson, Lee Ann Womack, John Paul White, The Lone Bellow, Ida Mae, Tommy Emmanuel, Elise Davis, and Jerry Douglas– whew! And, all moolah goes the dog rescue founded by Mz. Emmylou Harris, Bonaparte’s Retreat, and to Crossroads Campus, a homeless animals rescue which teaches job skills to undeserved or at-risk youth. Come on! As if you needed more reasons to register now! So do so now at americanamusic.org!